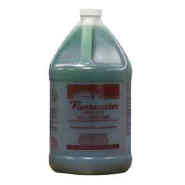 Extremely effective, even in hard or cold water, this liquid solution washes away road film, grease, grime, and soil when used through a pressure washer (at 600 psi). It's biodegradable too. 1 gal. 4/Case.